Actinic keratoses (Ak's) are rough, scaly patches on skin caused by excessive sun exposure. They are often called “precancers.” Ak's can develop into dangerous skin cancers if left untreated. Experts estimate that 40% of squamous cell carcinomas begin as Ak's. In fact the difference between an AK and a squamous cell carcinoma is truly a matter of degree / thickness. Ak's can be treated by cryosurgery (“freezing”), topical 5-fluorouracil (Efudex or Carac), imiquimod (Aldara or Zyclara), diclofenac sodium (Solaraze), ingenol mebutate gel (Picato),surgical removal, chemical peels, laser, or Levulan Photodynamic Therapy. Benign skin tumors are noncancerous growths on the body. 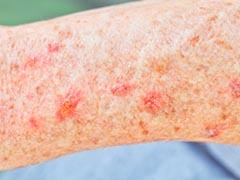 Benign growths can form anywhere on the skin. Many growths arise as a result of aging or sun damage. Some benign growths arise because of genetic tendencies. If a benign growth is not bothersome, it is usually not a problem. However, growths sometimes rub clothing or jewelry or interfere with work or activities. If this occurs, patients may want to have growths removed. BOTOX® is approved by the FDA for the treatment of excessive underarm sweating when topical medications do not work well enough. BOTOX® neurotoxin treatment helps control the symptoms of severe underarm sweating by temporarily blocking the chemical signals from the nerves that stimulate the sweat glands. When the sweat glands don’t receive chemical signals, the severe sweating stops. BOTOX® injections are expected to temporarily stop the production of excessive sweat in the treated areas only. Sweat continues to be produced elsewhere. During the procedure at the doctor's office, BOTOX® is injected into the underarm area through a very fine needle. 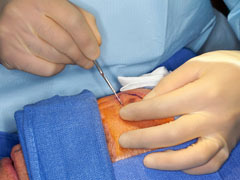 The actual procedure takes about 15 minutes and lasts up to 6 to 8 months. 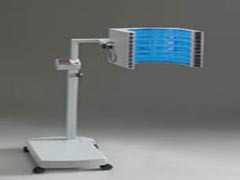 Photodynamic Therapy (PDT) is an FDA-approved treatment for actinic keratoses. Levulan PDT works best when actinic keratoses are thinner not thicker. Most require 2-4 treatment sessions 4 weeks apart for optimal results. PDT involves both the application of Levulan to the skin and the subsequent activation of this chemical about 1 to 3 hours later via a special blue light. This is a two step process.Levulan is 20% aminolevulinic acid HCl. This acid occurs naturally in the body and when applied to the skin makes skin cells more sensitive to light. Levulan is strongly absorbed into the skin by sun damaged skin cells, skin cancer cells, and into the pores where acne begins. Levulan has also been shown to improve the quality of the skin by increasing collagen production resulting in decreased pore size, decreased oiliness, and improved fine lines / wrinkles. Levulan has also been shown to improve acne, sebaceous hyperplasia (overgrown oil glands), aging of the skin, and other conditions. Skin cancer prevention is most important. 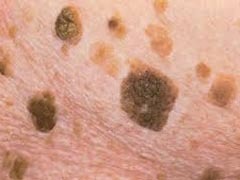 However, if you do develop a skin cancer, there are numerous treatments. Every situation and every patient is different. Dr. McCullough will work with you and your family to find the right treatment for you and your lifestyle and your budget.